Great machine. quiet gets things clean. laundry is fun again! Worst product ever! Never again. just keeps breaking down. completely annoying. does not clean the clothing well. leaks. This is the best washer I have owned over 46 years. We bought both the washer and the dryer and could not be happier. I elected NOT to purchase the drawers that go under them. I like to use the tops of the machine to fold the laundry. 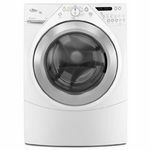 Energy Efficiency This washer uses very little water, very little detergent, bleach, etc. It "wrings" so much water out of the clothes, that they need less time in the dryer. 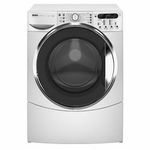 This is a great since the 220 line the dryer is plugged into costs more to run than the 110 line the washer is plugged into. Cleaning Time Overall, it takes a bit more time to wash but it uses 110 electricity. 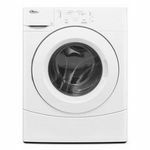 It cuts down on the drying time which uses 220 electricity (more costly) by leaving the clothing less wet than conventional washers. Performance There is no problem with performance. Everything I wash is cleaner than my prior washers while using less quantities of cleaning products. Ease of Use Follow the instructions in the manual and familiarize yourself with the controls. That's all there is to it! Design This washer has a nice clean looking design. I chose the white which has black trim. Durability My washer is almost 5 years old. It has survived normal household duty, nasty yard work clothing, my daughter, son-in-law, and 3 grands living with us for a month each time the Army moves them, and one household move. I fully expect to have it for a long time. Energy efficient and super cleaning machine! I love our washing machine. It's right near our boys' rooms so we are glad it's very quiet yet powerful enough to get things clean. 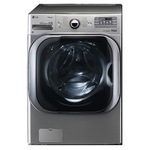 Energy Efficiency Our washer seems to be very energy efficent in the sense that it doesn't seem to waste much water. It gets things clean the first time instead of me having to wash multiple times. Cleaning Time It does seem to take a long time to do a load but everything comes out clean so it's ok. We would definitely be happier if it washed a bit quicker but I guess one can't have it all! 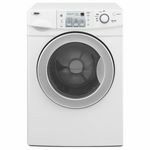 Performance Other than the time issue, our washer is great! It does such a wonderful job getting the clothes cleaned no matter how messy! Ease of Use Super easy to use! Everything is labeled. Even the kids love to help us load the washer and start it. Design It's still a bit bulky but then again, we do a lot of laundry and the loads are always maxed out. So again, can't have it all I suppose! I love that it sings to us when it's done washing. It's the only way to tell since it's sooo darn quiet! 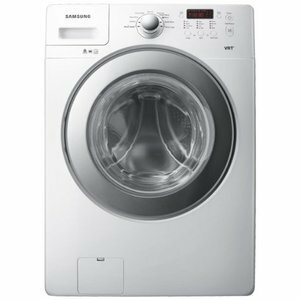 My old washer broke down and I had to buy a new one. After long research I was decided on the Samsung. The capacity is very good for a family of 4. There is always room even if I have big loads. The sound of the washer is quiet. My only complain is that the vibration in the last 3 to 5 minutes is strong. It washes very well. It's is both energy and water efficient. It qualified for both rebates from our water and power companies.